A flock of Chinese tech companies and music companies have entered concert streaming business since 2014, ranging from online video sites (Youku, iQiyi, Tencent Video), music (video) streaming services (Tencent’s QQ Music, Kugou, NetEase Cloud Music, Yinyuetai), social services (YY, Momo), gameplay broadcasting services (Douyu TV, Longzhu), conventional music labels and promoters (Modern Sky Entertainment, YEMA), to newly established startups (Panda TV). LeTV, a leading online video website and an early entrant into concert streaming market, streamed some 367 music concerts and festivals claiming 200 million views in total in 2015. 4.9 million viewers watched the live video stream of a show by pop singer Chris Lee in September 2015. LeTV now also regularly broadcasts shows by foreign singers, such as Katy Perry and Beyonce. The company’s goal for 2016 is more than 600 shows. Tencent, the social network giant that has been video-streaming music events either produced in-house or from third parties since 2008, saw more than half of their concert stream audiences from third- or lower tier cities where musicians seldom go to, according to the company. The concert by Jolin Tsai, one of the most popular pop singers in China, in December 2014 received approximately 40 million views within 48 hours on Tencent platform. Live Music, rebranded from Tencent’s self-produced music show, began to live stream in-house produced concerts on a weekly basis in May 2015. 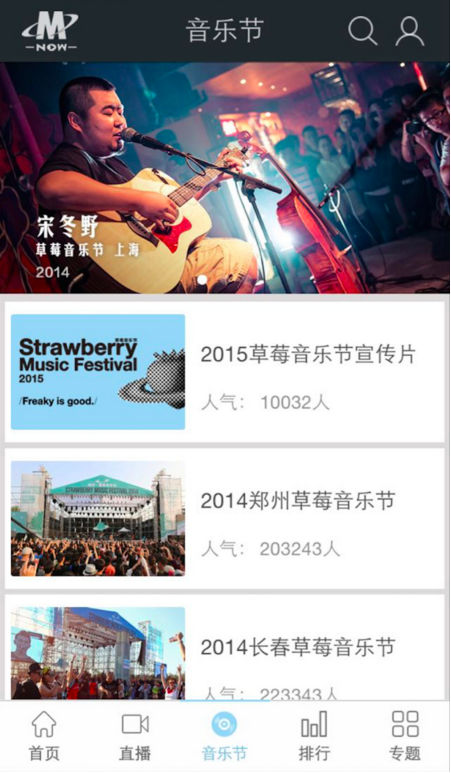 Strawberry Music Festival, one of the most popular music festivals in China, claimed a total of more than 18 million online views in 2015, three times of the number of the visitors to its shows in nine Chinese cities. Kugou, the music streaming service that broadcasted Xiangjiang Music Festival through its own video streaming service, claimed more than 10 million viewers during the five-day event. Live video broadcasting startup Panda TV, unveiled in September 2015, has Wang Sicong, the only son to China’s richest man Wang Jianlin, as CEO. The recently live streamed concert by T-ARA, one of the South Korean vocal groups that signed with the talent agency of Wang Sicong’s several months ago, attracted some 800,000 viewers to Panda TV. In 2014 LeTV got singer-songwriter Wang Feng to agree not only to stream one of his concerts, but also for the first time to sell tickets to the live streaming or video playback in the following three days. LeTV charges RMB20 – RMB30 (US$3-5) or lower for their monthly subscribers, a fraction of prices for average concert tickets. Some 48,000 LeTV users watched the live stream and 27,000 watched the playback in the following two days that generated a total of more than RMB2 million (roughly US$320,000) in sales. The online broadcasts of another three concerts by celebrated Chinese musicians later that year sold some 130,000 tickets on LeTV. Shortly after LeTV’s first try, Tencent’s QQ Music and Mango TV, the video site of Hunan Satellite Television (or Hunan TV), sold nearly 120, 000 tickets to the live broadcast of a concert by Hua Chenyu, a pop singer of the artist management company affiliated to Hunan TV. Tencent tried another time to charge for live streaming in late 2015. 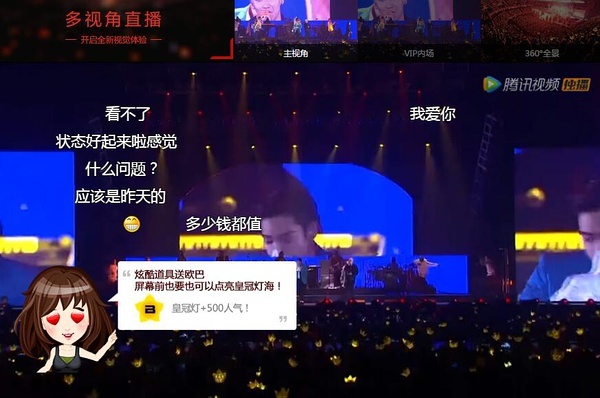 More than 120,000 users paid for the online access to the concert by BigBang, the South Korean vocal group, that took place in Macau, China, according to Tencent. Viewers were also able to purchase two merchandize items and virtual gifts on the streaming webpage. Most concert streams on major Chinese video sites are still offered free of charge. For these big tech companies the addition of concert video-streaming is an expansion in content, while profitability still isn’t a major concern. However live concert streams, free or not, have been generating revenue from advertising and virtual good sales. Live video streaming is generally considered more valuable than on-demand videos to advertisers. The existing popular interactive features or services on Chinese online video platforms, such as Danmuku commentary system, virtual gifts sending and real-time polling, have also been available with concert streams. Virtual gift sending is a considerable revenue stream to many Chinese online interactive services. Tech companies want to create more ways for artists and fans to interact so that the online presence of the concerts will be more attractive. To execute their online-focused ideas or have more control over costs, tech companies are putting more efforts toward organizing shows together with artists or their promoters instead of streaming conventional concerts. Several companies have had their own live music venues and hired professionals to organize shows. LeTV.com (since 2012) and Tencent’s QQ Music (since 2008) had been streaming shows organized by themselves before Chinese musicians and promoters allowed tech companies to video-stream their concerts. In December 2015 LeTV opened a live house and announced deals with a couple of South Korean entertainment companies for future shows. 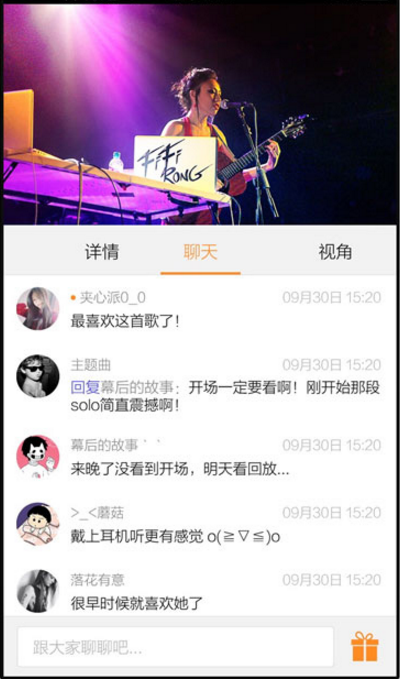 Tencent’s Live Music now produces at least four shows per month. Virtual goods with games or other online social services have been a major revenue source for many Chinese tech companies like Tencent, but when it comes to concert streaming they don’t take it as seriously as YY Music, a live video broadcasting platform where amateur singers get fame and cash in virtual gifts sent by their audience. YY Music has been handsomely profitable through virtual gift sales. Being aware of the concert streaming trend, YY launched Wanchanghui, in-house produced concerts for professional singers, in July 2015. The major differences from the rest of the players are (a) it’s only available online and (b) it enables more artist-fan interactions during the shows. All of the YY Wanchanghui shows are free of charge. But of course YY offers a variety of virtual items for viewers to purchase. The screen on the Wanchanghui stage displays comments and virtual gifts sent in by viewers. There’s also a chart showing the top virtual gift buyers, which YY believes encourages fans to spend more to show their support. YY even develops online games or gamification features tailored for certain artists for them to interact with fans during concerts. Unsurprisingly YY also creates custom virtual goods, similar to those in average online games. More than 5 million users visited the Wanchanghui concert by Rainie Yang, a Taiwanese pop singer, in October 2015. YY had organized a dozen Wanchanghui concerts in 2015. In September 2015 social app Momo launched Momo Xianchang, which is quite similar to YY Wanchanghui. The company hired Kubert Leung, a seasoned musician and TV music show director, to produce music shows at its own venue. 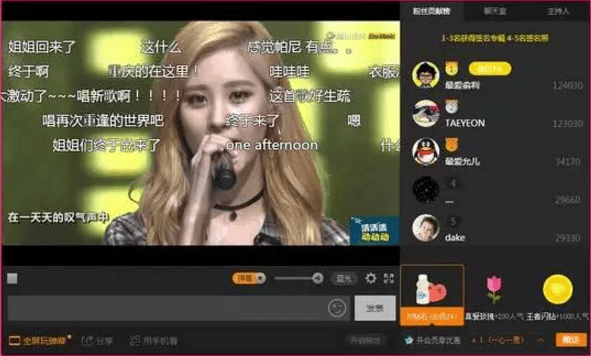 Similar to YY, Momo users are also able to interact with singers and sending virtual gifts during a streaming show. Momo thought they were in an advantageous position in the market with a young audience, with some 85% of its over 200 million registered users being under 32. And its users are used to purchasing virtual items for games or stickers on its app. The app has a local event platform where users can buy tickets. The event platform shows that the most popular events among Momo users were music concerts and festivals. Zhou Bichang, a musician popular among young Chinese, held a three-day concert on Momo in September 2015, performing one hour each day. It had had a total of 10.65 million viewers with one million peak concurrent viewers, according to Momo. Momo also found that the viewers got an average six new followers during the three-day show. Modern Sky Entertainment, the music company most-known for its music festivals and events, unveiled in April 2015 Modernsky Now a mobile app providing live streams or video playback of music events, either organized by the company or from third parties. Apart from the app its contents are also available on some smart TV platforms and a few online video platforms. The aforementioned Strawberry Music Festival, with Modernsky as the organizer, saw some 300,000 visitors at peak to the mobile app in 2015. Modernsky believes the future of concert streaming lays in consumers’ willingness to pay for quality content, according to its Zhang Dongliang, CEO of Modernsky Now. In July 2015 music festival curator Li Hongjie had the music festival he founded live streamed through YEMA Live, the video streaming app developed by his new startup. Around the same time the mobile app startup received investment from Chinese celebrated musician Wang Feng and Unity Ventures. YEMA Live has broadcasted more than 100 music events since its launch in 2015. The company has begun producing content in-house from their own studio. Like Modern Sky, YEMA also insists on charging for content. Though the previous concert streams were offered for free, the app hopes to monetize through virtual ticket sales and subscriptions in the future. The company promised to let musicians keep 70% of the total revenue. For platforms like Modernsky Now and YEMA Live, it’s easy to expand to other categories of content such as podcasts. Modernsky has begun signing celebrities to do online radio shows.